DiscountPaint.net :: MANUFACTURERS :: VARATHANE :: VARATHANE 00604 6041 CLEAR SEMI GLOSS INTERIOR CLASSIC (OIL) SIZE:QUART. 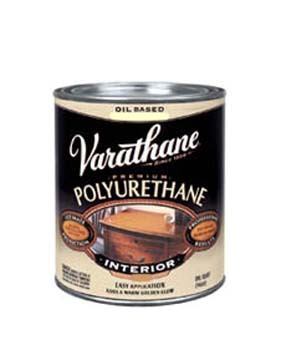 VARATHANE 00604 6041 CLEAR SEMI GLOSS INTERIOR CLASSIC (OIL) SIZE:QUART. Varathane® Premium Polyurethane Oil-Based Wood Finish is specially developed to let wood’s natural beauty show through with the highest clarity over other oil-based polyurethanes. Our premium oil-based finish gives wood a rich, golden glow that deepens with warmth over time. Varathane provides outstanding scratch and stain resistance to keep your interior wood projects looking great longer. Please read product labels for additional directions and precautions before using. Self leveling, no brush strokes. Adds a warm, golden glow. Fastest dry times of any oil-based polyurethane. Surface to be coated must be free of adhesion impairing substances. Minimum of two coats recommended. ENCORE 10500 10T1 PAPER CONTAINER SIZE:5 QUARTS PACK:100 PCS. OLD MASTERS 12001 DARK WALNUT WIPING STAIN SIZE:1 GALLON. DAICH VS-1000-378 VERTISTONE ROLL-ON WALL TEXTURE SIZE:1 GALLON. MESSMER'S 00125 EXTERIOR UV PLUS WOOD FINISH SEMI TRANS NAVAJO RED SIZE:5 GALLONS. OLD MASTERS 61401 PICKLING WHITE FAST DRY WOOD STAIN SIZE:1 GALLON. WOOSTER 5220 SILVER TIP FLAT SASH BRUSH SIZE:2.5" PACK:6 PCS. VARATHANE 200161H GLOSS CRYSTAL CLEAR DIAMOND WATER BASED INTERIOR POLYURETHANE SIZE:0.5 PINT PACK:4 PCS.